„Yellow beans are not good, and these ones are too small“ advises Ruven. The Dutch girls compare their selection of coffee beans. It is not that easy to decide which coffee beans are good enough to get into the export batch. For comparison Ruven shows us a box full of beautiful green coffee beans and another one with the inferior beans: too small, too brown or too deformed. The Export Quality Colombian coffee is the priciest regular Washed Arabica Coffee on the market – except for the superior Speciality Coffees. By contrast, the black, yellow and deformed beans in the other box is what you get if you order a 'tinto': A sweet brown liquid that tastes slightly like coffee.“They have to drink it with lots of sugar to cover the unpleasant aromas,” Ruven shrugs. Then he brings out a training box for coffee tasters. Small bottles contain the aromas one will find in coffee: vanilla, maple syrup, chocolate, lemon... The small group of coffee tourists sniff at the bottles, until someone shouts: “Yuck, this one is disgusting!” It turns out the training box also contains aromas like smoke or mould you want to avoid in your coffee. After the “theory class” we get a guided tour around the plantation and the cleaning and drying facilities. And then a cup of coffee – export quality, of course. About a dozen volunteers in yellow-and-grey uniforms marked “Bogotá” are holding the gate against a crowd of several hundred demanding to be let in. But the Colombian holidaymakers are cheerful: The have brought their children, water bottles, snacks and votive candles. All the latter can also be purchased along the steep path up Mt. Monserrat once the gate is opened for a brief period to let in the next batch of people. “...completely full...,” we hear a loudspeaker murmur, and indeed, after half an hour walking in merry atmosphere the stream of Sunday pilgrims comes to a standstill. There are juice stalls and chicken roasters, but no way up. About 400 m above Bogotá we have stunning views over the city, but there's an uphill queue of thousands between us and the summit with its pilgrim church. A few hours later, the Bogotá Gold Museum doesn't quite have to close its doors, but there's a steady stream of visitors both international and domestic as entry is free on Sundays. Three floors of exhibitions explain the techniques of gold-smithery, the style of all the pre-Columbian tribes of Colombia and the myths and symbols associated with the artefacts. Only the most beautiful and interesting pieces of a collection of 50,000 are exhibited. So many ancient gold artefacts does the museum possess that one installation consists of a room densely hung with “second rate” gold amulets, jewellery, breast plates and ornaments that any European museum could be proud of. We have travelled on to Medellin in the meanwhile and are now in the Zona Cafetera, Colombia's main coffee growing area. “Si Señora, and a pound of cheese.” The shop assistant takes one of the big round pieces of soft local cheese out of the fridge. It is 5:45 in the morning and still dark, but the small grocery store at the plaza in the village of Cocuy is already open and well visited. Men wearing brownish woollen ponchos and quite fashionable brimmed hats are having strong coffee and a sweet Danish pastry before starting their day. We pack the cheese carefully in the top pocket of the bag-pack and board the daily milk bus, the only way of transportation to the pastures above Cocuy. The milk bus is a veteran school bus that has four blue 180 litre milk barrels installed in the rear, instead of seats. Apart from the poncho-clad local farmers we are seven tourists on the bus, and as soon as the first snow fields come into view the Columbian family puts on sun lotion and UV filter sun glasses. The bus stops every few meters and a local with visibly Irish ancestry collects some bottles, buckets or canisters full of fresh creamy milk, while the driver precisely notes down the quantity. After a bit more than an hour the bus finally drops us at the entrance of the Parque Nacional Natural El Cocuy. At 3700 m, the air is crisp and chilly, and we are looking forward to our hike to the Laguna de la Plaza. “An easy day hike of about seven hours,” the girls at the park office had assured us. Although the path rises very gently, we are soon panting and have to reduce our pace. Maybe it wasn’t such a smart idea to do the trip from the Caribbean coast up into the eastern Cordilleras in just two days, we realize. We decide to stop every 30 minutes in order to make sure we drink enough. For a while this plan works out quite well. Between podgy succulents we progress, somewhat short of breath, through the dry mountainous landscape. After about 2 hours the path becomes steeper and we pass some turquoise blue lagoons that have formed in clusters amid swampy yellow pastures. Snow-capped mountains with names like Pan de Azúcar (sugar loaf) and Pulpito del Diablo (devil’s pulpit) peek over the lower crests. “This evening we can make a great risotto with onions, carrots and this yummy-looking white cheese,” we are still discussing our menu when we begin to notice a faint pressure in the forehead and the sinuses. We shorten our walking-resting rhythm to a ratio of 25:10 minutes and strive for the Cusiri pass, at 4300 m the highest point in our route. Despite the recommended frequent rests and drinking a lot of water we both feel miserable by the time the pass comes into sight. “No, thanks, I don’t feel like eating” Isa faintly declines a cookie. Checking our different maps for the route on the other side of the pass, we find out that the pass is more likely 4500 m high than 4300 m. “Huh, but we aren’t acclimatised!” With the added psychological momentum our stomachs rebel. We decide to track back to the small lagoons and to camp there. In about half the time we had needed uphill we reach a nice campsite, but it takes us ages to put up the tent. Every bend forward to fetch something out of the backpack, or even more difficult, to hammer the tent pegs into the ground, leads to sharp pain in the head and a disgusting accumulation of saliva in the mouth. “Urgh, the cheese! I’ll put it here outside the tent!“ The mere thought of risotto makes us feel sick. An hour later we drop onto our thermal mats. “Is this my sleeping bag?,“ Isa asks feebly before nodding off. The next morning we feel much better. We find that the word “risotto” evokes positive associations, and after a hearty breakfast of porridge and coffee we make a new attempt climbing the Cusiri pass. This time we have enough breath to marvel at the views, and at yesterday’s turning point, we triumphantly eat some crackers. From the Boqueron Cusiri (the sign posted here gives its height as 4410 m) we descend on a steep gravel path into the next valley and through boggy terrain up to the next mountain pass. Patio Bolas is just 60 m lower than the Cusiri pass, but we feel still fine and can enjoy the yellow and red shrubs and cactuses. 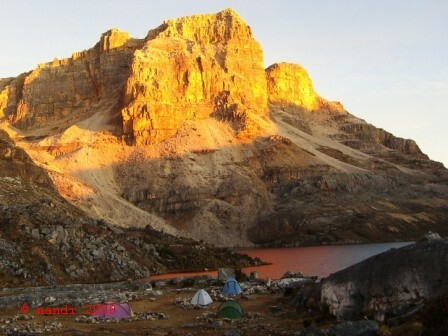 Nevertheless it takes us about 6 hours to reach the Laguna de la Plaza at 4300 m, and we are glad when we can pitch our tent at the designated campsites at the shore. This evening we have a delicious risotto, and although the temperatures go below zero during the night we sleep very well. The next day we hike all the way back to the road, where the milk bus passes in the morning and brings us to the village of Guican, from where we take another bus back to Cocuy. At 8:30 am, the ground staff at the domestic airport in Panama City still struggles with the Monday morning sleepiness. Only a few indigenous women in colourful skirts and bead accessories and a number of business travellers are waiting for their flights to the San Blas Islands or to David. We are far too early for our flight to Puerto Obaldía, a small settlement deep in the jungles of the Darien gap, near the Colombian border. At the check-in counter a poster showing gas cartridges, oil canisters, rifles and paint buckets informs us that "hazardous items must be properly declared before being taken onto the plane." Susana Ponce, our check-in assistant, is wearing her orange security vest leisurely over one shoulder, an invalid 2007 id and security card for the airport dangling around her neck. We decide not to think too much about the safety procedures at this airport. In the checked-in waiting area we slump into the dark blue plastic chairs and try to ease our nervousness about the "light aircraft" (the term used on our ticket confirmation) with a free cup of Duncan Highland Instant Coffee. The walls are painted in an non-matching different shade of dark blue and decorated with four tourism promotion posters, all at a disturbingly different height and variation to the right angle. By 9:30, the plane to David has left. All the remaining passengers - a local family in bright blue and neon green shirts, two young Spaniards and couple of solo-travelling men - are like us clutching the heavy plastic boarding passes labelled Panama – Puerto Obaldía. "To Colombia?" A greying officer in a light yellow shirt beckons some of us to his makeshift desk. In the absence of a proper immigration office at the domestic airport, Miguel Juvirez is doubling as an immigration inspector, noting down our data in a faded ledger. "There are usually five or six people going to Colombia every day that there is a flight to Puerto Obaldía," he willingly answers our questions. "But in the other direction, the plane is always full, and the majority of passengers come from Colombia." 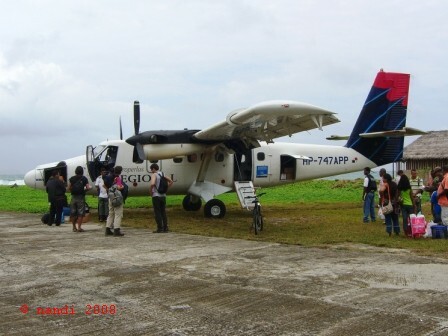 The light aircraft turns out to be a Twin Otter (300 series) with only 20 passenger seats. We take the two front seats, from where we have a free view into the cockpit. It looks rather well-used, and the pilot sets to work as if steering a ride-on mower over a weedy meadow. In Puerto Obaldía, we land on such a short stretch of tarred road that it seems at first that the plane might run right into the palm trees ahead. Next to the airstrip there is a playground, and a few houses line the only street of the village. "Where do we get our exit stamp?," we ask one of several men standing around. "I will give it to you when the Colombians have given their ok" he answers and tips meaningfully to his red baseball cap. It has "Panama migracion" embroidered on it. We do the round of offices, consulate, military checkpoint, exit and provisional entry stamps, chat with everyone remotely involved and with the only local woman wearing a T-shirt instead of traditional garb. She misjudges our age by 20 years, and apparently our gender, too. How else should we interpret her question whether there are a lot of effeminate men in Europe? Then we follow another guy with a red baseball cap and three young local women to the boat that is going to leave for the beach resort of Capurgana in Colombia. A few other passengers have already assembled on the beach where the open outboard motor boat is landed and are wrapping their luggage in large black plastic bags. 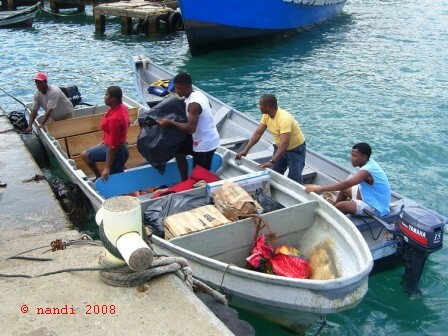 A sensible precaution, since the sea is rather rough and the one-hour boat ride wet. The next morning we are waiting for the next boat, which will bring us from Capurgana to the town of Turbo. "Are you speaking Portuguese?," a girl asks us curiously, assuming that we must be Brazilians if she doesn’t understand the language. Sharon has been in Capurgana for a week of snorkelling and beach holidays with her family. In the evening they strolled along picturesque streets lined with juice stalls and jewellery vendors and had dinner in one of the fish restaurants. Today the waves are even taller, and we sit in the front row of the boat. After ten minutes, the fun part of the rollercoaster effect wears off, and we and the happy holidaymakers behind us fall silent for the next two hours. When we alight in Turbo, we still face a 6-hour bus ride over mostly unpaved roads before we reach Montería, a stop-over for the night. A modern Pullman-bus then brings us to Cartagena: a dreamy walled town on the Caribbean coast, with pastel coloured colonial houses in palm tree-shaded streets. Tropical fruits are sold in veritable mountains from little carts, and tiny cups of coffee are offered at every other corner. We liked the Caribbean coast of Colombia so much that we stayed on longer than we had planned, including visits to the Tayrona National Park and the beach resort town of Taganga. We have now made our way to Villa de Leyva, only four hours bus ride from the Colombian capital city of Bogotá.